Ever since that motorcycle injury years ago, and the head injury he sustained, he has been more out of tilt. Then again, he may have always been nuts and the accident just cracked the cover enough to let his present persona out of the box. No matter,though. The fact is, Gary is dancing to a different tambourine than the rest of us. The internet is loaded with videos of him ranting, raving, lecturing, and waxing philosophically on earthly matters like physics. There are also some excellent video clips of him in his Oscar nominated lead role in "The Buddy Holly Story". Great music, and he sang the songs himself! Not too badly, either. My point is that before this Information Highway came into our lives there was this thing called privacy. If a celebrity wanted to retire and bark at the moon, they could, and not many were the wiser. Now, the world knows. In Gary's case, everything he does, no matter how looney, is done by choice. Writing a blog is no different. The thoughts, rants, blathering of those of us that have chosen this media are out there for the entire world to see. What we write is a direct reflection of who we are. This can gather readership, or repel it, and at times our writings can promote respect, or disdain. Same as print media. A blog can be many things. A journal, a diary, a vehicle to report goings on, a place for editorializing events, or a tool to attack others and their ideas. All are legal, and all are done everyday. Depending on how we present ourselves, and our thoughts will determine how we are seen. Are we credible, helpful, thoughtful, informative, or is our agenda something else, more off the wall? We have to be careful as to not ramble on like Gary Busey, or our credibility goes out the window, and that will affect our lives away from the internet as well. Blathering day after day about the same thing. Repeating ones self over and over again. Making judgments, assigning values to other peoples lives, and spinning events to make one look better, and to take the focus off ones selves are all things that some people do without the help of a blog, but when a blog is involved it is there permanently, and can be reviewed at any time. "Yep. Go read it on his blog." "Damn. I didn't believe you, but there it is." There is no going back, it's there. A snapshot of our personalities, and our agendas. Most are fine, harmless, but then there are those that take a different road. I strongly recommend reading the Gary Busey's of the blog world, especially if written by those that we normally would rely on for other things, like leadership, and experience in other matters. You don't have to look too far. They can be very telling, and they will most definitely give you a peak inside that "box" without having to have a motorcycle accident crack it open. Then, you can see things a whole lot clearer, especially just where the writer is coming from, and more importantly, just where they are going. Seeing things from a wacky perspective may even help. You gotta love the Gary's of the world, though, without them, the world would be a stale place indeed. Now, if you will excuse me, I am going to tune up my tambourine, and mambo around the house for a bit before I shave the kittens. It has been 3 days since this was posted, and comments are now closed. Oh boy, will someone pleeeeaaassseee help him drop his invisible anchor? Excellent Busey montage! Stale sounds pretty good to me! Goofy I can live with but when you talk about violence, kidnapping (not allowing individuals to exit an area),libel, slander, bloody cartoons, etc. etc. - I'll take a boring day any day! I loved this piece. 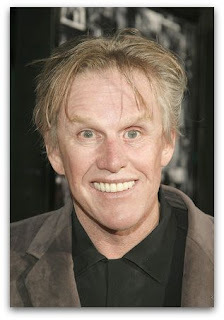 We actually have our own Gary Busey right here in Sturbridge or maybe he is more like Jerry Springer! Actually Gary seems harmless and only hurts himself, the one in town hurts others. I like your positive thought provoking blog. Keep up the good work. This describes our Busey character - to a tee. Malignant narcissism is a syndrome consisting of a cross breed of the narcissistic personality disorder, the antisocial personality disorder, as well as paranoid traits. The malignant narcissist differs from narcissistic personality disorder in that the malignant narcissist derives higher levels of psychological gratification from accomplishments over time (thus worsening the disorder). Because the malignant narcissist becomes more involved in this psychological gratification, they are apt to develop the antisocial, the paranoid, and the schizoid personality disorders. The term malignant is added to the term narcissist to indicate that individuals with this disorder tend to worsen in their impulse controls and desires over time. Malignant narcissism can be partially treated, with medications and therapy helping to reduce aggravating symptoms. Although narcissistic personality disorder is found in the current version of the Diagnostic and Statistical Manual of Mental Disorders (DSM-IV-TR), malignant narcissism is not. Malignant narcissism should be considered a theoretical or 'experimental' diagnostic category. Malignant narcissism can be comorbid with other psychological disorders not mentioned above. Malignant narcissism is not an official diagnosis, but rather a syndrome. Individuals with malignant narcissism would be diagnosed under narcissistic personality disorder. The malignant narcissist receives psychological gratification from feelings of power that come from the outside world. These positive social cues can be in the form of attention, power, and noteriety. Over time, the malignant narcissist becomes accustomed (even addicted) to this form of psychological gratification (also known as narcissistic supply). Similar to other addictions, the narcissist needs to feed off other people's emotions for narcissistic supply to help stimulate their psychological needs. Without narcissistic supply, the narcissist will undergo withdrawal symptoms similar to a drug addict. The malignant narcissist is inherently weak because he/she derives their ego functioning ability by constantly feeding off the emotions of other people (to build up their sense of self-worth to higher levels). This is why malignant narcissism is likened to a drug addiction. The drug addict (like the malignant narcissist) needs higher dosages of a drug to get the same after-effect. The narcissist (on the other-hand) needs to build up their sense of self-worth at increasingly higher levels to maintain the same level of ego-functioning. The malignant narcissist will go to extreme levels to build up their esteem, often resorting to antisocial behaviors and isolation of others (which is why antisocial, schizoid and paranoid personality disorders accompany this disease). If the malignant narcissist's grandiose fantasies fail them and they cannot feed their ego enough to function properly, they will undergo periods of dysphoria, emotional lability and anhedonia as well as display other negative symptoms of psychological disorders. Common to malignant narcissism is narcissistic rage. Narcissistic rage is a reaction to narcissistic injury (when the narcissist feels degraded by another person). When the narcissist's grandiose sense of self-worth is perceivably being attacked by another person, the narcissist's natural reaction is to rage and pull-down the self-worth of others (to make the narcissist feel superior to others). It is an attempt by the narcissist to soothe their internal pain and hostility, while at the same time rebuilding their self worth. Narcissistic rage should not be confused with anger (although the two are similar), and is not necessarily caused by a situation that would typically provoke anger in an individual. Narcissistic rage can be explosive or passive aggressive. Narcissistic rage also occurs when the narcissist perceives that he/she is being prevented from accomplishing their grandiose fantasies. Because the narcissist derives pleasure from the fullfillment of their grandiose dreams (akin to an addiction), anyone standing between the narcissist and their fullfillment of such accomplishments may be subject to narcissistic rage. Narcissistic rage will frequently include yelling and berating of the person that has slighted the narcissist, but if strong enough could provoke more hostile feelings. Narcissistic rage is frequently short lasting, and passes when the narcissist rationalizes the shame that they felt. Individuals with malignant narcissism will display a two faced personality. The narcissist uses an alter ego (projection) to help them create a false self to society, one that will help them increase their sense of superiority. This creation of an alter ego is linked to the narcissist's fear of being inadequate or inferior to others. This "alter ego mask" worn by the narcissist is ingrained into their personality, because they constantly want to project a sense of superiority to others at all times. Over time, the narcissist gains a sense of self worth and personal insight from the feedback of other people. It is common for the malignant narcissist to suffer from extremely low levels of self-esteem. To form "what seems to the outside world", a normal, functioning and empathetic human being. To create an illusion of greatness, because the narcissist entertains fantasies of an idealized self. The narcissist constantly builds upon this 'alter ego self,' creating a fictitious character that they use to show off to the world. By projecting a grander self, the narcissist is able to garner the esteem needs that are required to feed their ego properly. The narcissist is also capable of psychologically penetrating other people, learning their emotional and behavioral tendencies. The alter ego of the narcissist creates a masked identity, one that is both acceptable and respected to the outside world. In hindsight, the malignant narcissist uses this false self (alter ego) to help them feed off the emotions of other people. Although under poor conditions, the narcissist will take off this mask, frequently displaying a weaker or hideous personality (the true self). See also The Mask of Sanity. Friends of TRC should print out the comment “this describes our Busey character to a tee”, share it with him and encourage him to seek professional treatment. An intervention might be the best thing for this man, and certainly the best thing for the town.